If you can vividly recall the joy of struggling with math puzzles in high school in those school competitions, now is your chance to relive those feelings! On Friday 23 January 2015, Rabobank and Stichting Nederlandse Wiskunde Olympiade will jointly organise the Math Olympiad for Corporates (Wiskunde Olympiade voor Bedrijven, “WOB”). The WOB is meant to be an informal maths competition to (re)discover the joy of math. Don’t be afraid, the exercises won’t be PhD style mathematics: the exercises will all be high school level and it’s all about finding the right shortcut to get to an elegant solution. The competition is also a team effort, you are welcome to participate with two other colleagues from your company. 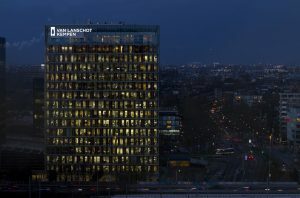 The WOB2015 will be hosted in Rabobank’s headquarters in Utrecht. The program starts at 12.00 with lunch in order to energise your brains. Afterwards, a tour starts through the new building which will also be a nice opportunity to see the stunning view from the top floor. Rabobank’s CFRO Bert Bruggink together with financial markets specialists, will share their views on the importance and use of maths in the financial sector. Next, the competition will start! Challenging maths exercises will test your analytical skills. Although the main goal of the WOB is to connect people sharing a passion for the beauty of mathematics, it would even be better to become the best Corporate Mathematics Team of the Netherlands. A trophy will be handed out to the winning team and after this exhilarating challenge we will all raise our glasses to the fun and exciting world of mathematics. Please be informed that the event will be hosted in Dutch, however we gladly provide you with an English copy of the exercises.